From the opening credits, set to Bing Crosby’s “It’s Beginning to Look a Lot Like Christmas” amidst a slo-mo montage of the consumerist nightmare that is Black Friday, you can tell whether you’re going to like this Christmas movie or not. For us, we definitely did; Krampus is the kind of Christmas horror-comedy that the current generation needs to consider as its own equivalent to Gremlins, and just like Joe Dante’s cult classic it is terrifying, hilarious and pleasantly festive all at the same time. The set-up certainly sets up the horror element early, but in a more familial way for audiences around this time of year. Two families, one spearheaded by Adam Scott and the other by David Koechner, are having the Christmas dinner from Hell, with family quarrels and eventual fisticuffs dominating over everything else. It causes young Max (Emjay Anthony) to lose the Christmas spirit, but in doing so incurs the arrival of Krampus, “the shadow of Saint Nicholas” as described by Max’s German grandmother (Krista Stadler), and his army of hellish festive minions that include demonic elves and murderous gingerbread men. You should know exactly the kind of movie you’re going to get when it includes “murderous gingerbread men”, and thankfully the movie does too. It mixes both horror and comedy so well that it makes Scouts Guide to the Zombie Apocalypse look even more shameful than it already was, and it’s incredibly fun to watch some of the most genuinely creepy imagery (not afraid of jack-in-the-boxes and Christmas tree angels? You will be after this film) being treated with the same kind of passion and enjoyment that Dante did all those years ago with his Gremlins movies. This film is from the mind of director and co-writer Michael Dougherty, who also made the admired Halloween anthology Trick ‘r Treat, and just like with that film he celebrates the holiday with the exact amount of warmth and appreciation along with some of the most intense horror elements since, well, Gremlins (and yes, we know we keep coming back to that film, but it’s just too awesome NOT to keep mentioning). Even the characters, who we first assume are all ones we’re going to end up wishing would just die already based on their obnoxious behaviour when first introduced, end up being ones that we really don’t want to see die, especially when it becomes very apparent from the first kill onwards that anyone, even the children, can be offed at any moment. It’s actually very refreshing to have that mind-set in this kind of horror film, knowing that absolutely nobody is really safe, therefore it makes things a little more unpredictable as the events go on and the monsters get even creepier. Speaking of which, whoever designed the majority of these creatures deserves their own personal Oscar; these are some DAMN impressive practical effects work, with each design being even more terrifying than the last, leading up to the eventual reveal of Krampus himself, who is a genuinely fantastically creepy creation in and of itself. Thank goodness most of them are actual costumes, puppetry, animatronics etc rather than just simply CGI – aside from the gingerbread men, for obvious reasons – because they just make things even scarier when we know for a fact that they were actually there on the set with these actors. In fact, watching these incredible effects play out like this make us slightly sad that this isn’t as common as it should be, and that between this, Mad Max: Fury Road and (hopefully) Star Wars: The Force Awakens among others, only a handful of major releases this year didn’t entirely succumb to the safety net of computer graphics to make the things they wanted to make. 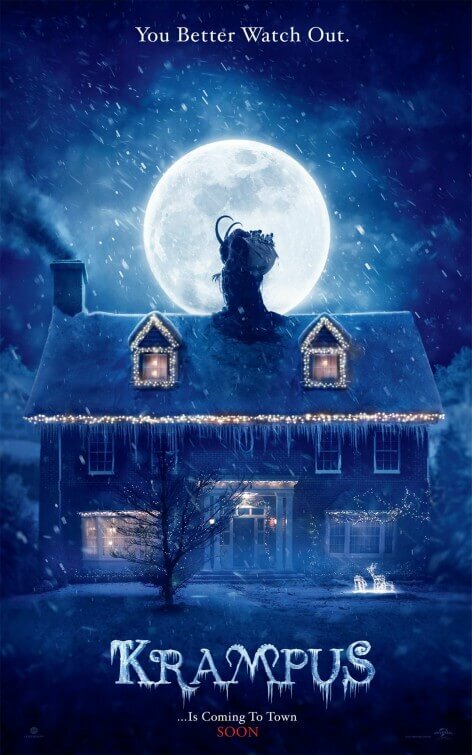 It will be a hard (chest)nut to swallow, especially as it reaches a very bittersweet and ambiguous ending, but Krampus should be remembered as a fantastically entertaining horror-comedy that can work just as well on its own as it could with a double-bill with – you guessed it – Gremlins. Krampus is a fantastically entertaining festive horror-comedy in the same vein as Gremlins, roasted with love by director Michael Dougherty and his admirable use of fantastic-looking practical creature effects, that should become a future Christmas classic for horror-comedy fans to watch around this time of year.